Beautiful autumn outing in the North Cascades. Thanks to a dry, sunny spell of weather the trails were in good condition. We hiked in on Thunder Creek trail, then took a side trail to Neve Camp. From our campsites, we hiked back to the junction where Thunder Creek trail meets Panther Creek trail and the latter ascends to Fourth of July Pass. No snow, no ice, a couple of fallen trees that could be stepped over or dodged pretty easily. When our group congregated at 9:00am on Saturday, 10/6/18, at the Wilderness Information Center in Marblemount, there weren't many people in line for permits. (Since the reservation season has ended as of Sept. 30, only walk-up permits were available.) We were able to obtain a permit to camp at 2 sites at Neve camp on the Thunder Creek trail. 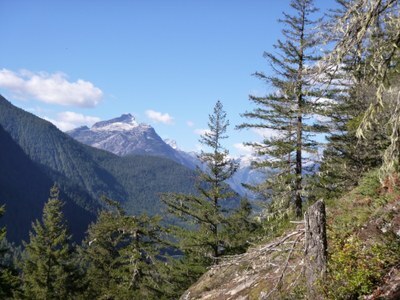 Some of the other options I'd researched for Thunder Creek or nearby trails (Panther Creek, Big Beaver via Ross Lake) weren't available, some were but since as per park rules each campsite only accommodates 4 people and our group numbered 6, we needed a spot with 2 campsites. Colonial Creek campground had already closed for the season but parking was still available there for overnight backpackers and day use. You still have to walk through the campground a bit to reach the amphitheater and the actual trailhead for Thunder Creek. Thunder Creek is a pleasant, gently rolling trail with a large, sturdy bridge about 1.5 miles in. After you cross the creek, there is the Thunder Creek camp area - great for families and novices, I'd say! Continuing on the Thunder Creek, you'll soon reach a signpost for the junction with the Panther Creek trail. It just points the way to 4th of July Pass though (doesn't actually say Panther Creek trail on it.) About .5 mi after this junction, another signpost marks the side trail that descends towards Thunder Creek to the Neve camp area's 3 dispersed sites and pit toilet. Neve campsites are pleasant, forested, and feature a fire ring plus flat spaces for tents. You'll hear the creek murmuring in the distance during your stay. The toilet is a wooden box over a pit, but private enough since it's not near any campsites. FYI: Darkness falls earlier at Neve since not only are you in fairly dense woods, but you're also at the bottom of a valley - so it was dim at camp well before the sun set. OK, back to Saturday: after setting up camp at Neve and having lunch, we did an outing to 4th of July Pass and reached the camping area up there. This was about 3 miles with 2200 feet of elevation gain from Neve. A grind, but a scenic destination! We took a leisurely break up there to enjoy the glacier views and sun. The photo attached to this trip report was taken up there. A quick descent back to camp, then dinner, then (since conditions permitted) we were able to enjoy a small campfire using wood we had collected from the 4th of July Pass area, which was much drier. We followed park rules and only collected dead and downed wood. Although Sunday dawned gray and cloudy, it didn't rain until everyone was back at the Colonial Creek campground at their cars. One member of our group collected a few mushrooms (gathering up to 1 liter of mushrooms are permitted by park rules). All in all, I very much enjoyed leading this backpacking trip with Jim Orsi's assistance and I think we all enjoyed this outing to the North Cascades. This was listed as a beginner-friendly trip and I'd recommend it as a good skills-building destination.